Hellooooooooo. You have found your way into the ‘The Well.’ This section of the SBNR.org site is where you can join in on discussions of spirituality, religion and consciousness that go a little deeper than typical conversations on SBNR.org. Here you will find posts and comments that reflect on issues of psychology, neurology, sociology, philosophy, cosmology, physics, human development, and other topics of intellectual interest. The Well – perfectly profound. 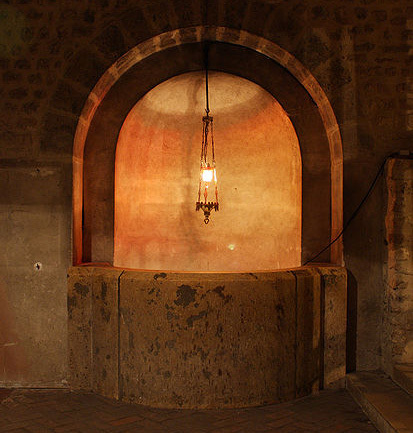 We come to the well for water…the source where our thirst is slaked, our thirst for that which is life-preserving and life-giving. We come to the well for our own depths…the source where our spirit is heard, for our quest to know that which is hidden and meaningful. We come to this particular well where we meet others approaching with their pitchers seeking the kinship of other souls who thirst for the wisdom and sustenance of purity. This is not an exact quote from Abraham Maslow, I don’t have the book with me to look it up. but i have carried the impression it let with me over the years because it rang as a truism. That if “Religion” was not willing to evolve with the People it claims to serve, it would find it’s self obsolete at some future time because the truth seeking hunger of people would not stand still for the non-moving Dogmas and traditions of religion. What an appropriate name. Spiritualism is deep as a well is deep. I can sit and feel life all around me and become silent within. I have a question, well i am hoping to lead towards some important chains of thought. We have plenty of persons that have had “Near Death Experiences”. There are many persons whom have sheared, even written book about First contact experiences with a Divine source. Are these worth discussion here or are they seen as machinations of the Mind, thus over-look or just written off because they are to easily seen as the ranting of mentally unstable persons? Granted; there are many person in our world that have fleets of Fantastic Thinking, and those with Bipolar, or even Schizophrenia conditions. But does that mean we should not notice that there may actually be active spiritual forces attempting to work with the Human race all with in the realm of Non-interference, but Guidance and with in a persons personal willingness to know? Thanks Sylvan, I think you bring up a good point. Many ppl are bound to ideas about what the next phase of life is because of our spoon fed concept from Religion that they forget to give them selves permission to thing out side the box and realize that life after this one will be some thing amazing and pro-active a constant experience of continuing growth. ever moving towards perfection and who know what else. And Yes, it is always a personal relationship that each of us have with the Divine and how it grows and moves us is out journey no one elses. Thank you Zym for your comments back to me. It is refreshing to be able to chat with people who ‘get it’. We are already eternal beings, we just get to change locations as we progress through eternity. I often think that it is possible we can either do as the spirit/universe suggests (assuming we have connected to said universe), or we can ‘contract’ with God as we are taught in our various religions. We will get what we choose. For me, I would rather be connected and move based upon real choice, instead of some contract written for me by a so-called representative of God. I spent 60 some odd years under the contract system, and I never really learned how to love anyone, even myself. Well anyway here I am!!! !